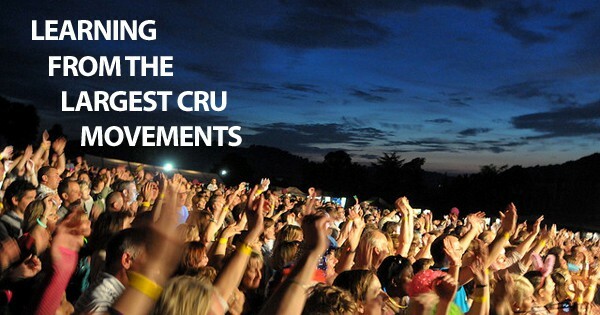 Last Summer I researched the largest Cru movements in America. I narrowed the list down to 8 schools and I called the directors of these movements. In a 30-45 minute phone call I picked their brains on how they operate as a large movement, what elements played into their growth, how they lead as directors, etc. Talking to the directors of the largest Cru movements was one of THE most beneficial things I’ve ever done: for my growth as a Director and for our movement. Over the next few blog posts I want to share what I learned. Let’s be clear from the start: Size isn’t everything. Ministry size does not equal ministry success. How do we measure how well we are doing in ministry? Is it by mere growth in numbers, or by a faithfulness divorced from all results? Ministry size does not determine our occupational or spiritual worth. AND, like many of you, we want to get the gospel to every single student on our campus. This is something we are not just hoping to do, but planning to do. Here’s what we figure: it will take about 100 trained, motivated, gospel-sharing Bible study leaders to have a shot at reaching the freshman class on our campus (around 4,000 freshmen= 40 freshmen to 1 Bible study leader). In other words- we’re going to need to build a big enough movement to realistically be able to get the gospel to every student. It’s not going to happen overnight but, for us, gleaning ideas from other (larger) movements has been the biggest accelerator of growth. These Cru ministries have anywhere from 400-1200 students involved. Many of these directors have seen their movements grow from 50 to over 500 in the past decade. These are not necessarily the 8 biggest Cru movements in the nation (but they’re probably in the top 15 – at least as of Summer 2011). I tried to pick schools from across the U.S. – usually choosing the largest Cru movements from each geographical region. I focused on traditional staffed campuses (no catalytic or city-wide movements). But since we’re all trying to build movements I think the learnings will be helpful for anyone in college ministry. What do Staff Do (how do they spend their time, what role do they play in the movement)? What contributed to your growth (are there any commonalities)? If you had to guess, what do you think were the biggest contributors to growing large movements? Very helpful, Tim! Thanks for sharing the wealth. Tim, thanks for taking the time to share your learning. I’m learning a lot by interacting with your reports. Haha. I did neglect the Upper Midwest didn’t I. This is great, Tim. Thanks for proactively going for it — learning & teaching the rest of us as you go! Keep pressing on! Tim, Keith Davy is telling us all about this in the National Director School. This is awesome. That’s really cool. Thanks Michelle. I agree with Neil D. Would have liked to see what you learn with the upper-midwest as part of research. I think the UMW region has its own unique challenges and could have given good insight. It has also seen dramatic increase in movement sizes in past 5-10 years. Great stuff though and glad you did this for the benefit of us all. Thank you! Thanks Jim for taking the time to comment! Hey Tim great insights and thanks for your labor. The Upper Midwest has some rather healthy movements fyi. 🙂 I am curious that none of the 8 movements you mentioned are in an urban setting. What did you find with regards to city movements? In addition these aside from SLO are all “classic” campuses even SLO is for that matter. What did you learn with regards to EFM efforts as they related? Did anyone do that well, ie Ole Miss does great at reaching Greeks did anyone excel at Impact or Epic for example? Just curious. I moved back to UMW after being at the Univ of Miami Fl and it is a “classic” setting in an urban context and as much attn as we are giving to cities I am curious is anyone “winning” at classic campus movement building in city contexts. And Scott Moffatt please dont tell me Gainesville is an urban setting. :0 Thanks again Tim for your insights. I welcome your feedback. Thanks for taking the time to comment Chip! What schools would you recommend me talking to in the UMW? I agree it would be very interesting to study campuses that are excelling with EFM or Greeks or Athletes. Wow Tim. I can’t tell you how helpful this is. I know it took a lot of work, and I for one think this a HUGE contribution to the body of Christ. I’ve been a campus minister for almost 8 years and I haven’t come across anything this helpful in a long time. Thanks again for your hard work, and please let me know if you have anything else like this, or access to any more studies on campus ministers/campus ministries. Thanks for the encouragement Alan! Seriously- helps make it worth it (taking the time to blog) knowing that it’s of help to others reaching students for Christ.